Mind you, given that this is the first of three circle quilts this year, I may be able to use that as a post title until sometime in 2018. I've not posted about this for a while as I'm trying to avoid endless pictures that all look pretty much the same, but I have been quietly making progress. I have spent ages worrying about whether I like the way I am quilting this, but have reached a point where I just have to let that go; I have done far too much to reconsider. It's the blank areas I'm not keen on really, so if push comes to shove I can go back and put in some extra stitching at some point. It would look better laid out flat but there was a cat lurking, and I just didn't want to have that argument today! For the first time in a few weeks I'll link up with Kathy today for Slow Sunday Stitching. Looks great! Your quilting is adding a neat texture to your circles and the background. Your quilting is beautiful!...I've just started mine and had the same thought, if it needs more I'll go back and do it later when I have an idea! 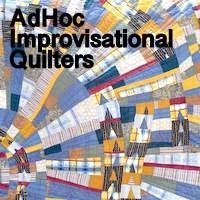 Now I very much like the quilting your doing, some of the circles look plumped a little by it and somehow even more huggable-around-you. Is it the wording strips that bother you, are they the plain areas? Your quilting is looking great! Can't wait to see the finished quilt! This is so pretty, and it really looks nice and soft. I'm sure you're enjoying a good visit with all those gorgeous fabrics again! LOL!! I soo admire the fact you stuck to those circles those!! I too love the fabric you chose! Lovely quilting. I always find it a puzzle to arrive at the right amount of quilting. If I'm not careful the quilting defeats its own object. I like the way it is coming together a lot, personally. And I totally understand the argument with the cat. Sometimes it is just not worth it! I enjoy process because that is the real stuff of any project. I really like the way you are quilting this. It is so pretty. So true! I'm happy to add in more stitches but really dislike removing ones already put in! It's beautiful hand stitching and I'm sure you could use that title for a long time. I like the image of the cat lurking...they do tend to lurk don't they. I like the quilting...and love your colors. Very pretty! I think the quilting looks lovely!